On the boys’ side, their 189-197 victory was highlighted by medalist Braden Lensing, who shot a career-best 37, on the par-36 course. Brady Hageman was one-stroke from earning runner-up honors as he finished the day with a 47. Brekin Tigges fired a 52, while Jacob Michels rounded out varsity scoring with 53. Additional linksters touring the course for SW were Shaun Klimesh (54) and Trey Kriener (56). Despite three athletes shooting their lowest rounds of the season, the girls tallied 247 to the Eagles’ 208. Recording a 55 was Makayla Hageman, followed by Sydney Becker’s 58. Presley Bushman came through with a 63, while Ruthie Frana completed the SW scorecard with 71. Others on the course were Kaitlyn Theis (73) and Helen Neuzil (88). 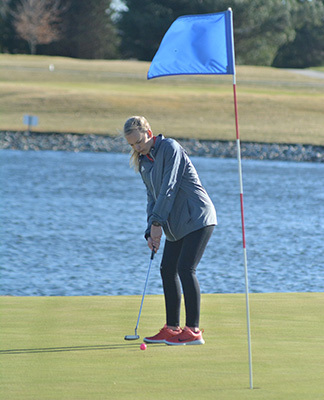 The Warriors compete next on Monday, April 15, against Postville at Tri-City Golf Club in Luana at 4 p.m. and host the Winneshiek County showdown with Decorah and Turkey Valley Tuesday, April 16, at 4 p.m. at the South Winn Golf and Country Club near Calmar.